I’m not being a drama queen when I say that SEO doesn’t exist without keywords. Keyword research is the very foundation of SEO. There is no way you can optimise your website and your content if you don’t know what keywords you are targeting. They’re the compass to your strategy. Now, you don’t have to be an SEO expert to come up with a huge list of keywords you want to target. Knowing what it takes to rank high for each one of them is a different story. As most marketeers out there are using the same tools to find their keywords (yes, I’m looking at you, Google Keyword Planner), many websites end up fighting over the same keywords. So what about those expensive keyword research tools from the likes of Moz.com, Ahrefs and SEMRush? Don’t they tell you about how hard it is to rank #1 for a given keyword — keyword difficulty? Not quite. While these tools can give you an idea, they’re never 100% accurate. In spite of what they’ll have you believe. Why? I’ll let you in on a little secret. Because no one knows how Google ranks pages. What we do know is that it uses over 200 different factors, of which the three most important are links, content and RankBrain (its fresh AI-algorithm). Not necessarily in that order. What we also know is that Google is continuously experimenting with machine learning and new AI-algorithms. Google’s search engine is thus in a constant stage of mutation, with very few to no certainties for us to build our SEO strategies on. Are we doomed for eternity? Not quite, we can still get pretty close to what Google is up to and use those insights when setting up SEO strategies. Should still count for something, right? For starters, you’re gonna want to find out the top ranking pages for your keyword. And, more importantly, the number of backlinks these pages have. Let’s go for dire wolf in this example (yes, I dig Game Of Thrones). I’ll be using Ahrefs’ Keyword Explorer throughout this post, but you can do more or less the same stuff with similar tools from Moz.com and SEMRush. None of these are free, but they all offer a free trial to get you started. We’re interested in the SERP results. For those who don’t know: SERP is just a shorter (and cooler) way to say Search Engine Results Page. 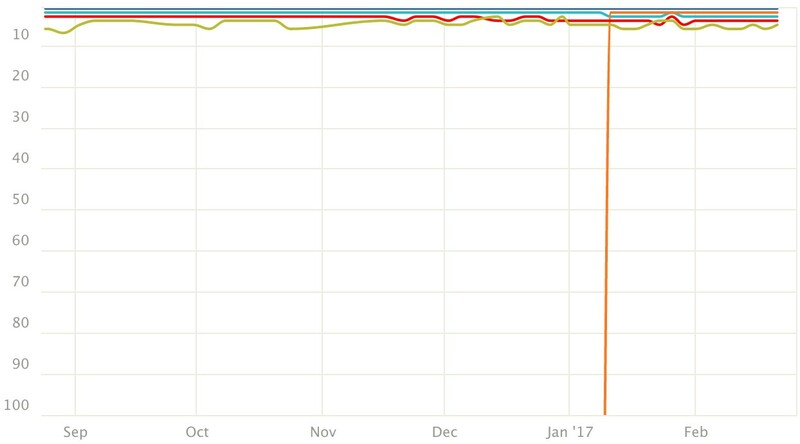 All the way down in Ahrefs’ Keyword Explorer. The first thing you’ll notice is the importance of Domains. The more domains link to a page, the higher Google will rank it in its search results. This is rule number 1. It’s not all quantity over quality though. In fact, 10 links from a website with high authority will rank the page higher than 100 links from a website with low authority. That’s why the number of domain links doesn’t linearly descend from positions 1 tot 10. The authority of the domain is indicated by UR or URL Rating. As you can see, UR actually has more impact on page ranking than the number of linking domains. That makes sense as UR itself is determined by the quality of the domains linking to it. It’s a more complex and aggregated metric than number of domains. So, to rank highly you need a lot of links and not just any link: links from high quality websites. Chances are you’re going No sh*t Sherlock on me by now, but bear with me. The amount of links are important for a page’s ranking, making it hard for startups to compete with bigger companies on SEO, but it’s not the whole story. You can outrank pages with more backlinks if your content is more relevant to the keyword you’re targeting. Let’s have a look at the keyword espresso. Wikipedia’s piece on espresso being on top is no surprise. What happens then, is more interesting. How do two pages with rather low amounts of backlinks outrank a page with 2336 domains linking to it? Let’s have a closer look. 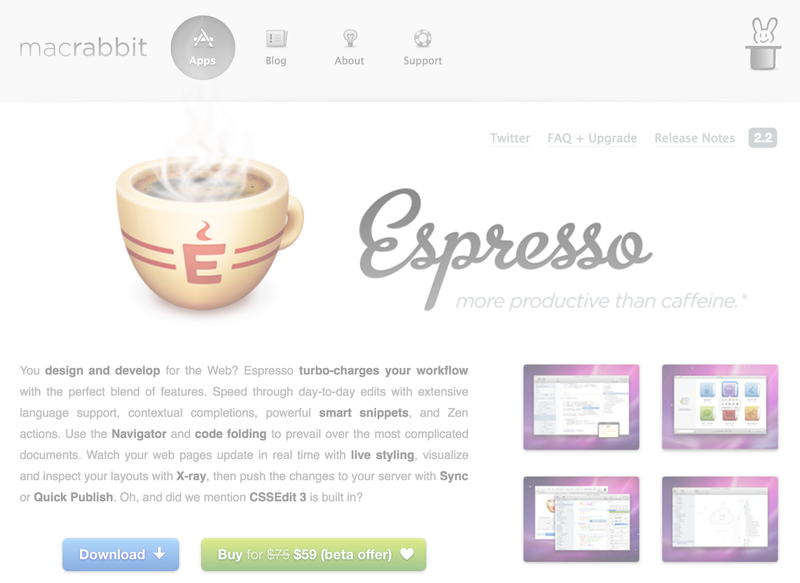 MacRabbit Espresso turns out to be productivity software, not coffee. 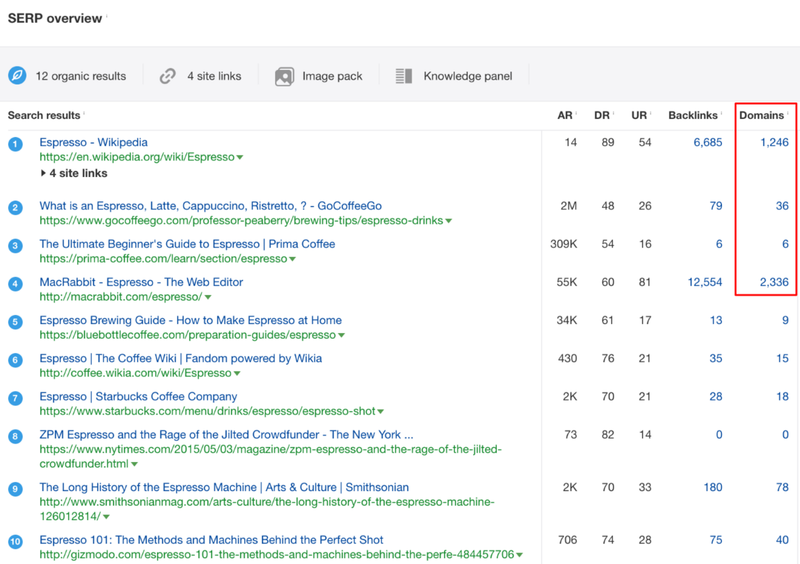 Based on the content associated with the keyword espresso, Google knows you’re more likely looking for coffee than you are for software. 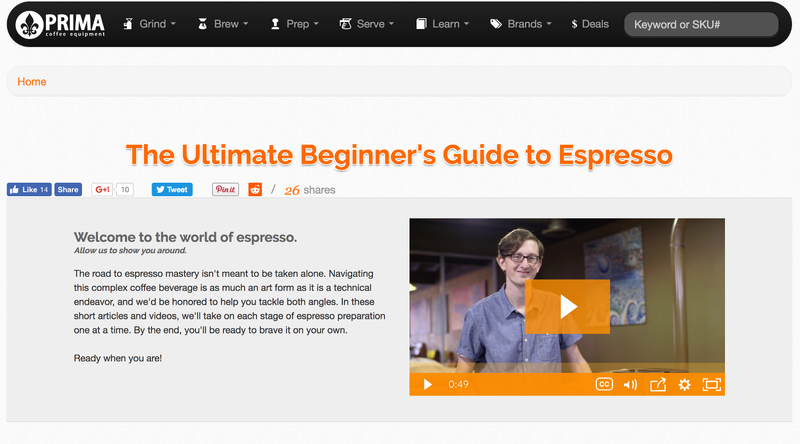 In fact, the two pages outranking this page are very on-topic when it comes to espresso and coffee. Still, it’s curious how a page with just six linking domains outranks other pages who are clearly also dedicated to espresso. Let’s have a look at its backlink profile. Location of the link on the page. Is the link likely to be noticed or send traffic? How many other backlinks are on the page? Back to espresso and content relevance. What we learnt is that you can outrank pages with a lot of links if your content is more relevant to the search query. However, a lack of relevant content like we’ve seen before is rather rare in Google. Usually, the top ranking pages for a search query will have very relevant content. At best, there will be pages on top with slightly imperfect content. This will give you far less of a competitive edge when targeting keywords. 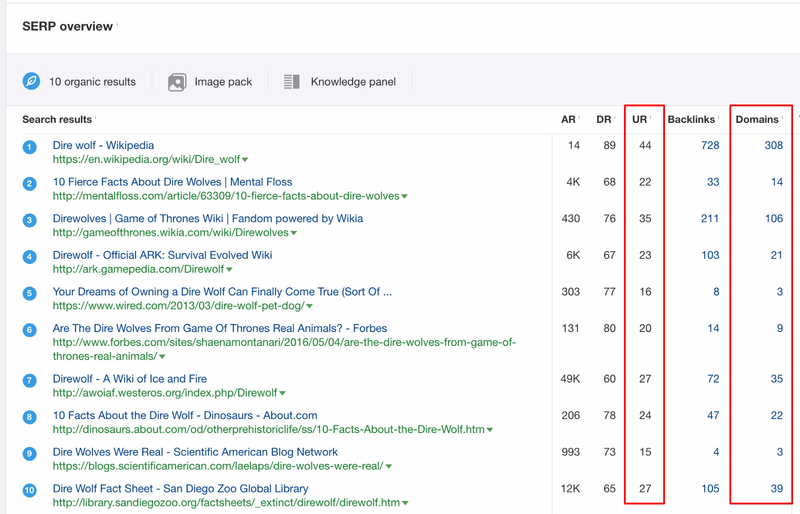 The question now is: how do you know if the top ranking pages for your keyword are lacking relevant content? And: how do you make your own page as relevant as possible to your keyword in the eyes of Google? There’s still a common misconception that when you use a keyword in your page title you’ll be likely to outrank pages that don’t use the keyword in their title. That may have been true in 2010, but it’s 2017 now. Today, Google is smart enough to know about the relevance of certain keywords. 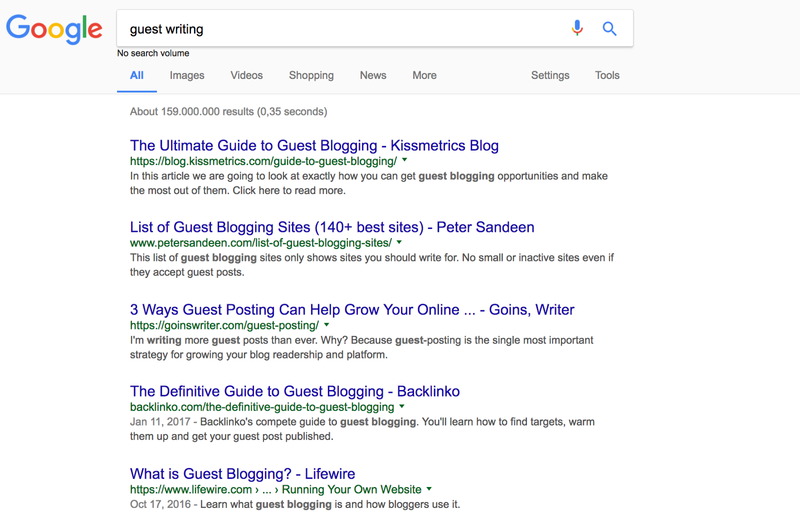 This means you won’t be able to outrank a page that uses guest blogging in their title for the keyword guest writing by simply putting that in your title (given that other page has more backlinks, a higher UR or both). Google knows the two keywords are family, as is guest posting (result #3). There’s no use in trying to fool Google by being clever about the titles and subtitles. It knows what your page is about. In fact, from a study of 2 million keyword searches Ahrefs found that about 75% of the top 10 ranking pages on Google don’t have a single mention of the keyword in their title. If you’re looking for quick wins here, I’ll have to disappoint you. Outranking current top 10 pages purely on content is no walk in the park. But hey, you don’t get owt for nowt, right? First and foremost, you’ll need to learn how Google works, how it interprets search queries and matches them to topics it crawls from the Internet. If that sounds complicated to you, that’s because it is. To outsmart everyone, you’ll have to start studying the wondrous ways of how Google works. Despite its extraordinary complexity, Google is still a machine and if you understand how it works, you’ll have an edge over your competitors. Two things you would have to get into are latent semantic indexing (LSI) and latent Dirichlet allocation (LDA). In short, they’re about how Google takes into account keywords that are related to the main keyword, in context. This kind of semantic SEO can generate over 25% more clicks than standard SEO. Personally, I settle to just know about this. I’d rather write content for actual humans than to please a machine. Approach things like LSI and LDA as guidelines, not dogmas. I think you should avoid losing touch with what your target audience wants to read by wanting to craft a Google-perfect piece of words. Your readers are human so you should be too if you want to connect with them. Find a balance between what they want to read and what Google is looking for. Feed yourself inspiration by reading the top ranking pages for a given keyword and list up what other keywords they rank highly for. These keywords are likely to be associated with your target keyword by Google. Then, use your brain, the most powerful tool of them all. If you read the pages related to a certain keyword, you’ll build up an internal thesaurus of topics and other keywords inside of your own head. This will allow you to produce logical, coherent and relevant quality content on your topic. Not all searches were created equal. For example, people searching for online surveys in the United Kingdom may not be looking for the same thing as people in the US. As it turns out, people in the UK seem more interested in online surveys as a way to make some money on the side. People in the US on the other hand tend to search more for tools to create online surveys. This is called user intent and is yet another case of Google knows. User intent is said to trump topical relevance. 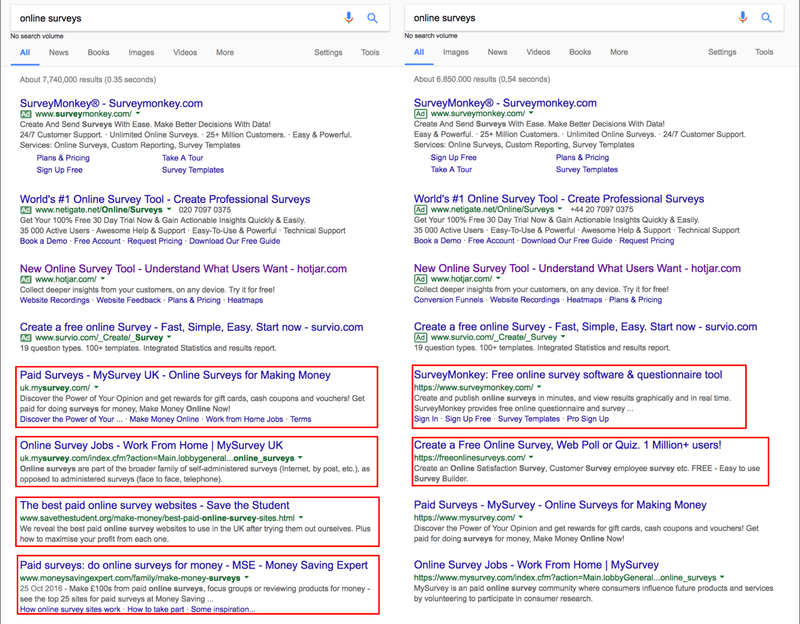 So even if you have to most on-topic page of all times when it comes to creating an online survey, it’ll likely rank under a page offering money for filling out surveys. Meaning you’re gonna want to know what people’s search intents are when they’re searching a keyword in your geographical target market. A great way to figure out if a keyword is difficult to rank for is to check if Google is happy with the relevance of search results. You can do this by looking up the SERP results for your keyword, in Ahrefs Keyword Explorer or similar tools. If results have been the same for quite some time, it’ll be hard to outrank them. If results have been changing a lot, it’s likely Google is still looking to get the best content for its users. And compare with Facebook marketing. Now, my current Ahrefs plan only allows me to go back six months so takeaways are limited here. But you get the picture. Content marketing has seen one page jumping up in last six months with the other ones being comfortably on top for quite some time. The story’s different for Facebook marketing, with several pages battling fiercely for the top positions. So, to find out the difficulty to rank for a given keyword you can take into account all of the things mentioned above. You can also just pay to use a tool like Ahrefs (or Moz.com or SEMrush) and have their Keyword Explorer find out the difficulty for you. While this is the easy option, it’s probably not enough to rank among the first 10. 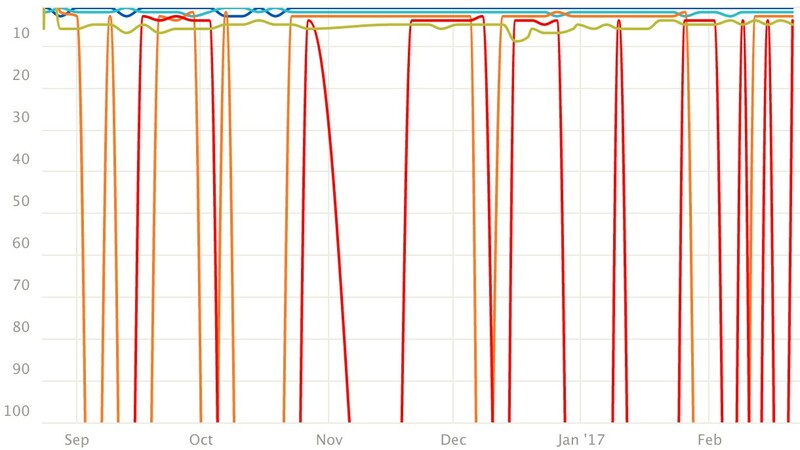 Ahrefs says t calculates these metrics from the assumption that Google heavily relies on backlinks to determine which pages should rank in the top 10. Now, as we have just seen, there’s more to play with. Google’s top 10 is another league, one where you’ll need to know about all of the weird little things Google cares about in order to win it over. That being said, a tool like Ahrefs can save you a lot of time and energy when putting your initial list of keywords together. Let’s have a look at dire wolf again. Ahrefs says it considers 0–10 easy, 11–30 medium, 31–70 hard and 70–100 super hard. You can combine KD difficulty with data about keywords your page currently ranks pretty good for. This should give you a pretty good initial idea of the keyword’s potential. While this is all very nice and stuff, it doesn’t really tell how you should get started on keyword research in the first place. The very first thing you should do is brainstorm with your team and come up with a list with keywords that are related, associated to what your core message is. Think of sort of thesaurus of just words that help tell the story of what you want to stand for. Don’t look at Google at all at this particular stage. Then, screen all of these keywords using the tips in this post and some solid SEO tools. Pick the ones that are most easily to rank highly for, yet are very relevant to your brand’s identity at the same time. Don’t make the mistake of redirecting all of your strategy and content to fully optimise for Google. People know quality and unique content when they see it and will be coming back for it. More posts on both SEO and keyword research in particular will be coming to this blog in the next few months. Most of them will be more practical (less theoretical) than this one. This is just to make sure you know Google before you try and start seducing it. We hope you liked this post. If you did, hit ❤ and spread the word! You can follow us @salesflare on Twitter for more hot stuff on crm, sales, growth hacking and startups.